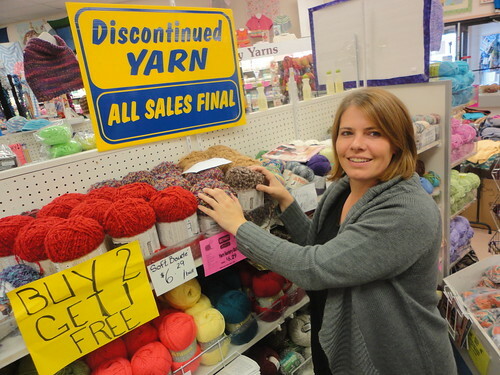 Knitter's Paradise is another name for the Spinrite Factory Outlet at 230 Elma St in Listowel Ontario, or if you really love knitting, you might call it Heaven on Earth. In terms of prices and selection, those looking to buy knitting supplies will find there's really nothing else like it this side of Montreal. The shelves contain complete collections of Patons, Bernat, Lily, and Phentex yarns with full colour ranges and patterns to inspire. 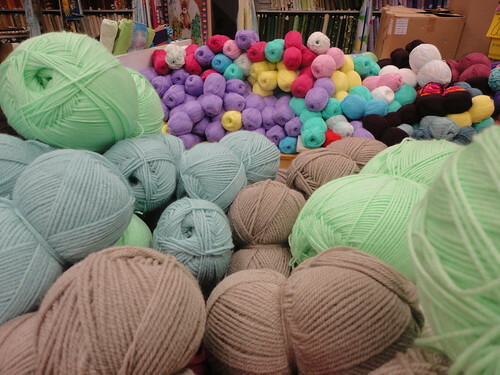 They also have Canada's largest selection of discontinued yarns - large moving boxes and bins direct from the factory dominate the center of the room and are heaped high with mountains of coloured thread. But once this yarn is sold (at deep discount), those colours will no longer be available, so shoppers should be sure they have enough yarn to finish whatever garment they're knitting at home. The walls above the shelves are decorated with knit and crochet items on display, including elaborate sweaters, simple socks, adorable baby wear and cozy afghans. These many homemade items are on display to inspire shoppers and spark visitors' creativity. Check out the sweater buttons! 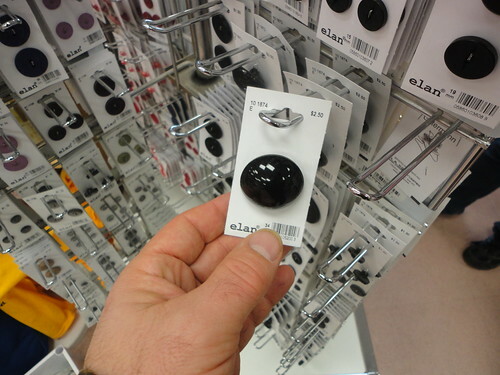 This is a great place to locate hard-to-find knitting accessories; every stick for stitching is right here. Hooks and needles, straight and circular in every material including steel, plastic and bamboo. Circular needles, cable needles, stitch holders, as well as buttons and wool wash are all you'll need to build and care for your projects. 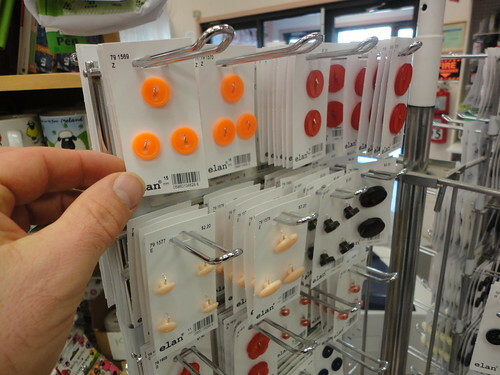 Brightly coloured buttons and hooks are made to match the exquisite and vibrantly coloured yarns for sale on the shelves. Some of the most popular beginner projects for newly hatched knitters are dishcloths and potholders. 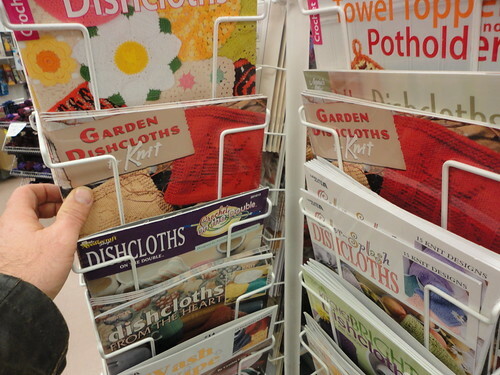 The Spinrite Factory Direct Store sells a great many pattern books and special thermally protected yarns that are perfect for cooking and cleaning in kitchens. Looking for more pattern books? The store has a complete library of Patons, Bernat and Lily pattern books, alongside classics from Leisure Craft, Annie's Attic, and the American School of Needlework. They also carry magazines from Better Homes and Gardens “Simply Creative Crochet” and Crochet Fantasy as well as “Learn to Knit and Crochet” Books and “Technique Books” for every level of crafter! 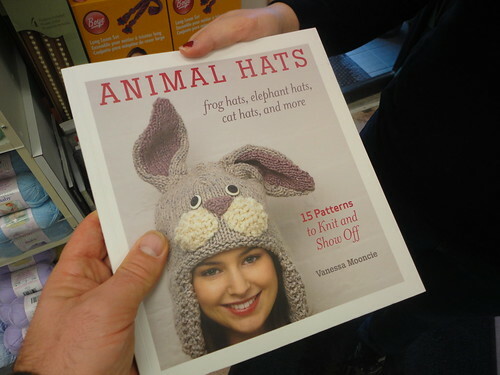 The most popular pattern book in 2013 is Animal Hats by Vanessa Mooncie. 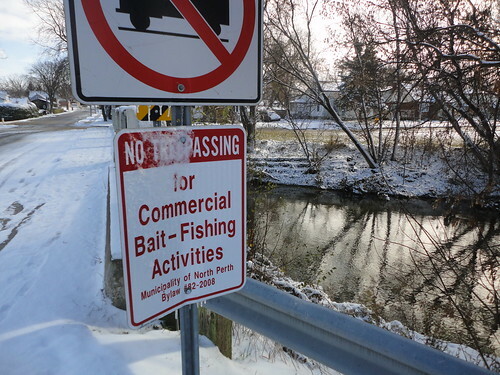 You may wonder how it happened that the mother-of-all-knitting supply stores should be located in the middle of nowhere, which is another name for Listowel Ontario. But a brief history lesson will confirm that although there was once a large supply of local wool available here, it was the power of the mighty Maitland River that first attracted the 'woolers' to the area back in the 1860s. 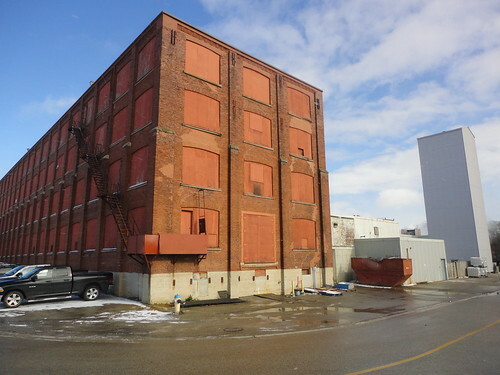 This particular site was a leather tannery until the 1880s. 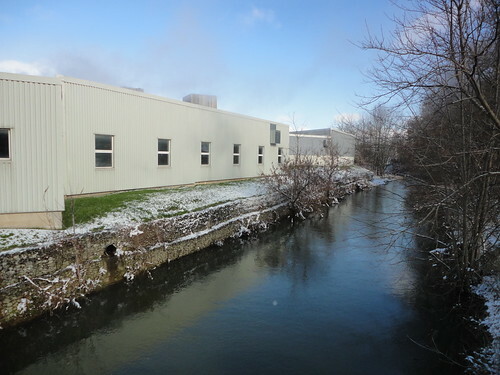 More about the history of Spinrite Woolen Mills can be found on Ancestry Guru. Spinrite by the Emma St bridge on the west bank of the Maitland River in winter time. The reason that the Perfect Knit wool mills survived for a hundred years to eventually become Spinrite a couple decades ago is because they were smart enough to service the home knitting market. This organization survived while so many other wool mills failed because they provided yarn for knitting, and because they were experts at dying wool in fashionable colours. That's still true today. 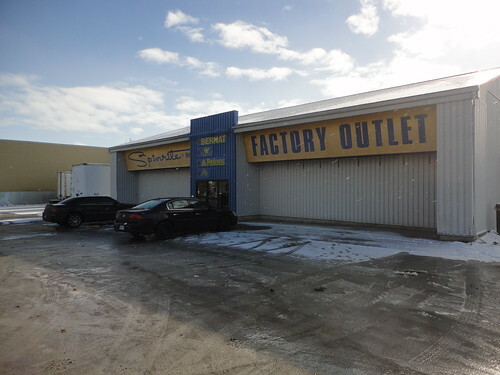 The Spinrite Factory Outlet in Listowel Ontario is only one snow covered field away from the Spinrite woollen mills, which is a not a mill at all, but rather a huge dye shop. You know the common expression what's 'dyed in the wool will never change' is of particular relevance here. You see woven fabric can be dyed in a number of ways; garments can be coloured after they're completed, or the threads may be dyed before they are woven together. When knitwear is described as "dyed in the wool," that means the wool itself is dyed before being spun into threads, so the colour is least likely to fade or change. Coloured yarns are what the majority of knitters find most inspirational, and a recent survey of the hobby revealed that 24%!o(MISSING)r a full quarter of all knitters across North America regard the hobby as a creative outlet. Creativity is ranked as #1 motivation source is followed by "keeping hands busy" at 15%!,(MISSING) "making gifts" at 13%!,(MISSING) and "stress relief" at 10%! (MISSING)Most respondents, 26%!,(MISSING) spend 1–5 hours on their craft per week, 16%!s(MISSING)pend between 6–9 hours and 18%!b(MISSING)etween 10–19 hours. So I reckon its worth driving two hours west of Toronto to get to this warm and fuzzy place.